In Part I we had a brief look at the question of intermittency – renewable energy is mostly not “dispatchable”, that is, you can’t choose when it is available. Sometimes wind energy is there at the right time, but sometimes when energy demand is the highest, wind energy is not available. The statistical availability depends on the renewable source and the country using it. For example, solar is a pretty bad solution for England where the sun is a marvel to behold on those few blessed days it comes out (we all still remember 1976 when it was more than one day in a row), but not such a bad solution in Texas or Arizona where the peak solar output often arrives on days when peak electricity demand hits – hot summer days when everyone turns on their air-conditioning. The question of how often the renewable source is available is an important one, but is a statistical question. 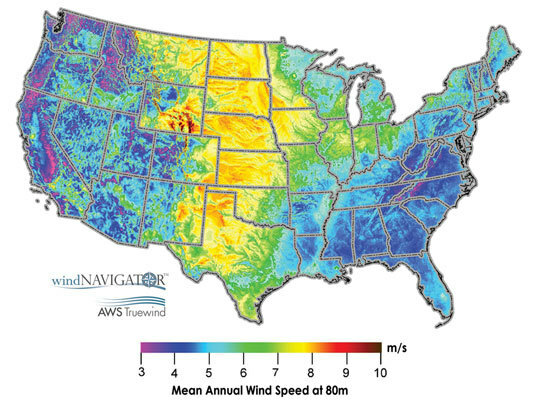 The wind does always blow “somewhere”, but if we consider places connected to the grid of the country in question the wind will often not be blowing anywhere, or if it is “blowing” the output of the wind turbines will be a fraction of what is needed. The same applies to solar. (We will look at details of the statistics in later articles). The fact that at some times of peak demand there will be little or no wind or solar power doesn’t mean it provides no benefit – you simply need to “backup” the wind / solar with a “dispatchable” plant, i.e. currently a conventional plant. If you are running on wind “some of the time” you are displacing a conventional plant and saving GHG emissions, even if “other times” you are running with conventional power. A wind farm doesn’t need “a dedicated backup”, that is the wrong way to think about it, instead there needs to be sufficient “dispatchable” resources somewhere in the grid available for use when intermittent sources are not running. The costs and benefits are the key and need to be calculated. However, the problem of intermittency depends on many factors including the penetration of renewables. That is, if you produce 1% of the region’s electricity from renewables the intermittency problem is insignificant. If you produce 20% it is significant and needs attention. If you produce 40% from renewables you might have a difficult problem. (We’ll have a look at Denmark at some stage). Remember (or learn) that grid operators already have to deal with intermittency – power plants have planned and, even worse, unplanned outages. Demand moves around, sometimes in unexpected ways. Grid operators have to match supply and demand otherwise it is a bad outcome. So – to some extent – they have to deal with this conundrum. What do grid operators think about the problem of integrating intermittent renewables, i.e., wind and solar into the grid? It’s always instructive to get the perspectives of people who do the actual work – in this case, of balancing supply and demand every day. What do energy experts really think about renewables in the United States? To what degree are conventional baseload units reliable? Is intermittency a justifiable reason to reject renewable electricity resources? To provide at least a few answers, the author conducted 62 formal, semi-structured interviews at 45 different institutions including electric utilities, regulatory agencies, interest groups, energy systems manufacturers, nonprofit organizations, energy consulting firms, universities, national laboratories, and state institutions in the United States. In addition, an extensive literature review of government reports, technical briefs, and journal articles was conducted to understand how other countries have dealt with (or failed to deal with) the intermittent nature of renewable resources around the world. It was concluded that the intermittency of renewables can be predicted, managed, and mitigated, and that the current technical barriers are mainly due to the social, political, and practical inertia of the traditional electricity generation system. “Wind, for instance, can be forecasted and has predictable patterns during some periods of the year. California uses wind as an energy resource but it has a low capacity factor for meeting summer peak-loads. The total summer peak-load is 45,000 MW of load, but in January daily peak-loads are 29,000 MW, meaning that 16,000 MW of our system load is weather sensitive. In the winter and spring months, big storms come into California which creates dramatic changes in wind. We have seen ramps as large as 800 MW of wind energy increases in 30 min, which can be quite challenging“. “Germany had to build a huge reserve margin (close to 50 percent) to back up its wind. People show lots of pictures of wind turbines in Germany, yet you never see the standby power plants in the picture. This is precisely why utilities fear wind: the cost per kWh of wind on the grid looks good only without the provision of large margins of standby power“. The author looks at issues surrounding conventional unplanned outages, at the risks and costs involved in the long cycle of building a new plant plus getting it online – versus the rapid deployment opportunities with wind and solar. I’m aware of various studies that show that up to 20% wind is manageable on a grid, but above that issues may arise (e.g. Gross et al., 2006). There are, of course, large numbers of studies with many different findings – my recommendation for placing any study in context is first ask “what percentage of renewable penetration was this study considering”. (There are many other questions as well – change the circumstances and assumptions and your answers are different). Perhaps incongruously, no less than nine studies show that the variability of renewables becomes easier to manage the more they are deployed (not the other way around, as some utilities suggest). In one study conducted by the Imperial College of London, researchers assessed the impact that large penetration rates (i.e., above 20 percent) of renewable energy would have on the power system in the United Kingdom. The study found that the benefits of integrating renewables would far exceed their costs, and that ‘‘intermittent generation need not compromise electricity system reliability at any level of penetration foreseeable in Britain over the next 20 years.’’ Let me repeat this conclusion for emphasis: renewable energy technologies can be integrated at any level of foreseeable penetration without compromising grid stability or system reliability. Unfortunately, there was no reference provided for this. Claiming that the variability of renewable energy technologies means that the costs of managing them are too great has no factual basis in light of the operating experience of renewables in Denmark, Germany, the United Kingdom, Canada, and a host of renewable energy sites in the United States. As I commented earlier I recommend readers interested in the subject to read the whole paper instead of just my extracts. It’s an interesting and easy read. I can’t agree that the author has conclusively, or even tentatively, demonstrated that wind & solar (intermittent renewables) can be integrated into a grid to any arbitrary penetration level. In fact most of the evidence cited in his paper is at penetration levels of 20% or less. Germany is cited because the country “is seeking to generate 100 percent of its electricity from renewables by 2030”, which doesn’t quite stand as evidence (and it would be uncharitable to comment on the current coal-fired power station boom in Germany). Denmark I would like to look at in a later article – is it a special case, or has it demonstrated the naysayers all to be wrong? We will see. This does mean – it should be obvious – that each region and country will get different answers with different technologies. Linking together different regions with sufficient redundant transmission capacity is also not trivial, neither is “adding sufficient storage”. Of course, I would like to suggest another perspective to keep in mind with the discussion on renewables: the sunk cost of the existing power generation, transmission and distribution network is extremely high, and more than a century of incremental improvement and dispersion of knowledge and practical experience has led us to today – with obviously much lower marginal costs of using and expanding conventional power. But, we are where we are. What I hope to shed some light on in this series is what renewables actually cost, what benefits they bring and what practical difficulties exist in expanding renewables. Conventional power systems suffer variability and reliability problems, just to a different degree than renewables. Conventional power plants operating on coal, natural gas, and uranium are subject to an immense amount of variability related to construction costs, short-term supply and demand imbalances, long term supply and demand fluctuations, growing volatility in the price of fuels, and unplanned outages. Contrary to proclamations stating otherwise, the more renewables that get deployed, the more – not less – stable the system becomes. Wind- and solar-produced power is very effective when used in large numbers in geographically spaced locations (so the law of averages yields a relative constant supply). The issue, therefore, is not one of variability or intermittency per se, but how such variability and intermittency can best be managed, predicted, and mitigated. Given the preponderance of evidence referenced here in favor of integrating renewables, utility and operator objections to them may be less about technical limitations and more about tradition, familiarity, and arranging social and political order. The work and culture of people employed in the electricity industry promote ‘‘business as usual’’ and tend to culminate in dedicated constituencies that may resist change. Managers of the system obviously prefer to maintain their domain and, while they may seek increased efficiencies and profits, they do not want to see the introduction of new and disruptive ‘‘radical’’ technologies that may reduce their control over the system. In essence, the current ‘‘technical’’ barriers to large-scale integration of wind, solar, and other renewables may not be technical at all, and more about the social, political, and practical inertia of the traditional electricity generation system. I’ve never met a grid operator, but I have worked with many people in technical disciplines in a variety of fields – in operations, production, maintenance, technical support, engineering and design. This includes critical infrastructure and the fields include process plants, energy, telecommunications networks, as well as private and municipal. You get a mix of personality types. Faced with a new challenge some relish the opportunity (more skills, more employable, promotion & pay opportunities, just the chance to learn and do something new). Others are reluctant and resist. The author of the paper didn’t have so many doubts about this subject – other studies have concluded it will all work fine so the current grid operators are trapped in the past. If I was asking lots of people in the field doing the actual job about the technical feasibility of a new idea and they unanimously said it would be a real problem, I would be concerned. I would be interested to know why grid operators in the US that the author interviewed are resistant to intermittent renewables. Perhaps they understand the problem better than the author. Perhaps they don’t. It’s hard to know. The evidence Sovacool brings forward includes the fact that grid operators currently have to deal with unplanned outages. I suspect they are aware of this problem more keenly than Sovacool because it is their current challenge. Perhaps US grid operators think there are no real technical challenges but expect that no one will pay for the standby generation required. Or they have an idea what the system upgrade costs are and just expect that this is a cost too high to bear. It’s not clear from this paper. I did peruse his PhD thesis that this paper was drawn from but didn’t get a lot more enlightenment. However, it’s an interesting paper to get some background on the US grid. “In fact most of the evidence cited in his paper is at penetration levels of 20% or less. Germany is cited because the country “is seeking to generate 100 percent of its electricity from renewables by 2030″, which doesn’t quite stand as evidence (and it would be uncharitable to comment on the current coal-fired power station boom in Germany)”. Germany might indeed be a good case to look at for your purposes. It had close to 20% penentration for intermittent renewables in the first half year of 2015. It has comparatively small interconnection capacity compared to its total electricity consumption, and next to no hydro storage capacity. “The current coal fired powerstation boom” is mostly bogus, too. Yes, there was a batch of new coal powerstations coming online between 2010 and 2015, but only one more is looking likely to get completed for the forseeable future. Their capacity is small compared to the already existing coal capacity, and the total output of coal-fired powerstations was pretty much constant the last few years. Of course, consumption is generation – net exports – losses. Where do your numbers come from? (And generation will be a little higher than consumption, which reduces the % production of renewables a little). where intermittents have about 9 TWh per Month averaged, which corresponds to about 20% of the annual German electricity consumption of ~600 TWh. Those are obviously preliminary data, but usually the BDEW and ISE are very reliable sources for Energy production/consumption data. Note that I do not suggest that Germany has already reached 20% wind+PV consistently year after year ( the first half of 2015 was VERY windy), only that the grid is already able to copy with such a high penetration without significant problems. I get 16.8% from your BDEW slide (average of the 6 months – I added up the 6 percentages and divided by 6). cf the 2014 value from BP of 90.9 kWh. This seems like a big increase. There might be a half year bias value where the wind is high in the first half of the year. One of our statistics might be wrong.. I can’t read German, nur ein bisschen Deutsch. It’s interesting because they are looking at “intermittent” sources output as a % of [minimum demand plus interconnection to other countries]. We can see that Ireland and the UK have a bigger technical challenge than Germany (at that time). Perhaps things have changed. I found the metric an informative one. I do not think the min load + interconnect metric is very useful for evaluating grid integration technical difficulty. It is easy to cap wind power output at times of excessive supply (and it happens regularly in Germany at stormy weekends). Those times of excessive supply represent only a very small fraction of annual wind power output, and wind power on stormy days has only a minimal (or even negative) spot market value, so next to no revenue is lost by turning some turbines out of the wind at those times. note that about 90% of all time the output is below 50% nameplate capacity, and virtually never above 80%. I’m not sure how you got that number out of the BDEW slide. The percentages are relative to the year 2014, not fraction of overall electricity production. The y-axis is in TWh, you need to compare it to the total yearly output to get a percentage. I checked the chart again, and with a bit of rough measurements I get a value of 58 TWh (give or take one or two TWh) for wind onshore + wind offshore + PV , which appears to be in good agreement with the ISE number of 59,2 TWh. There is indeed a half year bias, because the first half of the year usually has a much higher wind output, while PV output is much more symmetrical during the year. Accordingly, the average value for the year 2015 will be more likely in the 17-19% range than 20% or even more. So when people point to the new constructions they ignore the greater decommissions. 2) Since the time of planning for these new plants, almost 10 years ago, the market had changed significantly: power usage did not grow 2% percent per year anymore and renewables grew much faster than expected. Most proposed projects, even those that are under construction are therefore canceled or put on hold. BDEW expects only two new coal plants to come online this year and after that: none until at least 2025. German coal boom: One can try to count the carbons using a lot of math and strong claims, but when the input is wrong the result is unfortunately nothing more then a poorly informed opinion. No one expects 100% of nameplate from a wind turbine. 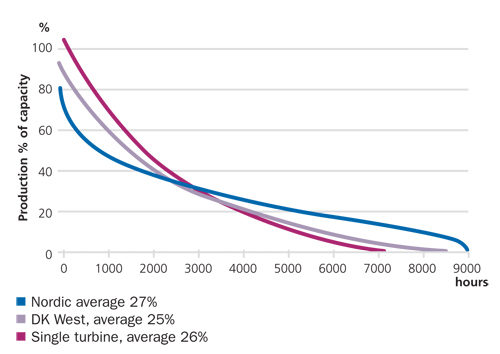 It’s the maximum when the wind is blowing at the max value for the turbine. Everyone in the field knows this. It’s like saying the maximum speed of the average car is 150 mph but when we measured the average of all the cars on the road it was 50 mph so car statistics are “a costly fantasy”. People’s incorrect use of nameplate value demonstrates their confusion. There is an average % capacity factor – e.g. in the high 20% for the UK, in the 20% for some European countries, in the teens % for Germany (I haven’t looked up the numbers, they vary year on year). It depends on the turbine, or group of turbines, and where it/they are installed, and the period in question. Sovacool is one researcher who I take with a pinch of salt. One of his famous works is a research paper where he used a broad range of reports in the literature to determine an ‘average’ CO2 price for nuclear power. It came out high, as three near-identical studies from a team of researcher was included in the mix. That’s pretty poor methology in my book. His PhD is about distributed grids and he seems to be convinced it is something that brings huge benefit – i.e., something that should be done – the only thing holding it back is “power structures” and “entrenched interests”. I’m not sure how well he actually understands the US power network. However, I don’t understand the problems, limitations and opportunities of the US power network for renewables so I’m not going to say he’s wrong, although I suspect he might be. The perspectives from his interviews were interesting even if his understanding of grid challenges is suspect. I’ll take a look at his paper and PhD when I get the time. As for his rightness or wrongness, from his wiki page he seems to come from the “social justice” and HPS side of things – so what is right from his perspective might not be right from a strict science or engineering perspective. on August 9, 2015 at 3:42 pm Mike M.
Having read Sovacool’s paper, I have to agree with you. Section 2 on the opinions of grid operators is very interesting. In section 3 he argues that there is variability and unpredictability in the grid anyway, so what’s the big deal? He ignores the fact that the amount of variability and unpredictability matters. Section 4 is mostly just special pleading. His lack of technical knowledge is often apparent. In the end, he dismisses the opinions of the experts because they disagree with the way he wants things to be. SoD’s post is fairly critical of Sovacool. I think SoD was being nice. And provides no reference! Neither did he investigate the performance of wind turbines in the area where his quoted grid operator works. Now if I was reading that section of that report, I would immediately be asking myself, over what timescale? I would also be checking definitions of “Forced Outages”. But Forced Outages apply to individual power units, and are usually measured as hours of unplanned unavailability (or lower than rated power output) divided by hours of planned availability over a year! I am amazed at what can be published in Policy Journals, and more amazed that that paper has 90 citations according to Google Scholar! My feeling reading the paper was that his technical expertise in the field was low. I almost didn’t publish the article because of this, but then remembered why I found it informative at the start – because of the grid operators’ opinions. I did also check some of the papers which cited this paper. I think I looked at 4 or 5. One of them unquestioningly repeated Sovacool’s assertion about the “power structures” (as in human power structures) and vested interests being the reason for opposition to large renewables. But the other papers simply cited him because of a few basic (uncontroversial) statements about the US power industry. As Mike suggests, I was being nice to the paper’s author. I’m glad you did publish the article, there is a worrying lack of commentary on these kinds of papers in academia: a serious blog with a moderate atmosphere commenting on these papers is a boon to those trying to find facts amid the chaff. on August 12, 2015 at 2:08 pm Mike M.
Thanks for putting flesh on my bare bones comments. If I thought it was worth the time, I could add additional items. That is an especially egregious of Sovacool’s lack of knowledge. The grid operator was almost certainly referring to capacity credit but Sovacool confuses that with capacity factor. Here are a pdf-file with the electrical generation data in Germany. (See below ‘Strommix’) The site is in German, the English part may be incomplete and outdated. As far as I know, the countries with a wind plus solar generation over 10% are Denmark, Germany, Ireland, Italy, Portugal, Spain. And California. And maybe some smaller countries, states, or islands. in first post of series, I gave a number of links (too many to make it into daylight?). Average US wind capacity in 2007 was less then 2% of total capacity. Is it possible that operators which are relatively inexperienced in integrating wind are overly conservative about the feasibility of integrating a large amount of intermittent power source (i.e. 20%)? More recently (2011) there has been an attempt to document experiences and best practices from a large number of grid operators from 18 countries that together handle about 3/4 of worldwide wind capacity. Several of these grid operators manage even more then 20% wind capacity. Learning from other operators and e.g. best practices, improved forecasting abilities, improved control room decision support systems, faster markets and improved grid codes (requirements for wind and pv to contribute to grid quality) will allow integration of higher levels of intermittent capacity. As I remember from when I was working, proper cost accounting requires that you use a clean sheet, design the plant from the ground up and cost it that way. I don’t see this being done for wind and solar, particularly for the dispatchable resources needed. The costs, as near as I can tell, are based on using the current grid infrastructure and assuming that the only cost is for the solar arrays or the wind turbines themselves. That’s cheating. Not exactly a good match. Almost a worst case scenario. Looks like a lot of very long transmission lines would be necessary to make this work. In case you hadn’t noticed, they’re talking about 140m towers for wind turbines now. And the turbines may soon be lifted much higher. on August 7, 2015 at 3:39 pm | Reply Mike M.
20% of what? I don’t doubt that grids can handle 20% of capacity from solar and wind. But that is maybe 5-8% of production, depending on the mix. To get 20% of production from solar and wind, as in Germany, is a problem. 20% of energy production, i.e., TWh, not nameplate capacity. on August 7, 2015 at 7:13 pm Mike M.
I am skeptical of the claim that 20% of production can be handled easily. Do you have a reference? From what I’ve read, Germany is having a lot of trouble and they have not yet reached 20%. And they are part of a much larger synchronized grid, which should help deal with the problems. But I have not researched this, so maybe what I have read was exaggerated. Maybe a future article sorting out conflicting claims about the German experience? Mike, what is ‘easy’ and what is ‘a lot of trouble’? Sorry, Mike, both references above are about capacity, not production. I haven’t been able to access this paper, but didn’t try too hard because I’d read his chapter in the textbook. I will dig into these points further in a subsequent article. Likewise an article about the German and Danish experience. on August 7, 2015 at 9:36 pm Mike M.
The German HV grid is more or less unchanged since the flurry of activity after the reunification, and can apparently handle close to 20% intermittents just fine. The improvements deemed necessary to handle three times the current amount of intermittent electricity (i.e. about 50%) are estimated to require only about an increase of 0.5c/kWh grid usage fees (numbers from the official “Netzentwicklungsplan 2013” (grid evolution scenario)). Or is the US grid situation fundamentally different compared to the German? on August 7, 2015 at 7:16 pm Mike M.
Probably only in that tripling electricity prices in the U.S. might cause a revolution. It’s about a 1500 mile run of transmission line to get power from Kansas, say, to either coast, further to get to the high population density of the Northeast. Germany is about the size of the state of Montana. Imagine locating wind turbines in Poland to power Moscow and Paris. Mike, besides a revolution it would also spark a big effort of much needed efficiency improvements. That’s why an average German household pays as much as an average American household. Some US states actually have prices pretty close to average European, e.g. Connecticut, New England, Alaska, Hawaii, California: ~ 0.20 /kWh. Well then I suggest supporters promote a plan that doubles or triples energy prices in order to get to a Germany level renewables infrastructure in the US. At least it would be an honestly costed plan. Part of the distrust of renewable plans is how they are overtly oversold in cost and energy production. Estimates are wildly divergent, how can this be with so many projects in production now? They pretend that it’s not going to cost anybody anything because someone else is going to pay for it or a massive arm waving exercise is performed in which it is alleged to pay for itself. 30% renewables for Chicago will take X wind turbines and Y solar arrays. At today’s costs that will be $Z per taxpayer. I suppose RPJ may have run these numbers once or twice when he evaluated some fantastical claims. The average new German house has about half the floor space of the average new American house. HVAC costs, by and large, are proportional to floor space. Comparing German and American electricity use is, therefore, comparing apples and oranges. DeWitt Payne, exactly what does floor space have to do with intermittency of supply? Granted it will result in less total energy use per domestic customer, but how does it influence times of use? Or are you just throwing factoids around in the hope something will stick, without any regard to the logic of the case. on August 9, 2015 at 3:47 pm Mike M.
One should quote what one is commenting on. i would take figures from spain and portugal regarding wind energy with a pinch of salt. the figures for solar in spain when examined showed people were supposedly supplying solar energy to the grid during night time. What is the “night-time solar production”? It sounds like an oxymoron. +Eamon, um, Gemasolar melts salt and uses the heat latent in the salt to boil water and drive pretty standard power turbines. Salt holds heat for a long time. Thanks Hypergemetric, but I was asking about terminology – as usual I could have been clearer! “Thermally Stored Solar Energy” would be the phrase I’d use. re this statement: (and it would be uncharitable to comment on the current coal-fired power station boom in Germany). I came across this in a trade publication I read. An article on the future of coal in germany. Those interested may like it. It is much more complex picture than the line above suggests. Germany is burning more coal than ever, but that is driven by nuclear elimination from their grid. The article describes the difficulties of running coal plants in current situation largly from grid operator POV. My own impression, after reading it, the problems described can be mitigated by market solutions. It’s an interesting article. Trade publications are often a step up from general media. I expect this is a big issue. In Gross et al 2006 (a UKERC paper that we looked at in Part IV) they basically carry out a literature review on the costs of having conventional power on standby for intermittent renewables and derive apparently low costs for the inefficiency of these conventional plants operating “unconventionally”. I have not dug into the actual data yet but in the end real operating data will likely be the only useful data on the real costs of frequent start / stop. Apart from “peaker gas plants” (designed for the purpose of startup/shutdown to take advantage of peak prices) none of these baseload plants were designed for the way they are now expected to operate. In my experience, infrastructure with “a life of many decades” is a very uncertain reality with wide variations in actual performance. Heating up and cooling down large metal structures with key operating parameters likely has little data on the real maintenance costs – you find out that your 15 year estimate of the life of section X was wrong and the life is actually 8 years costing $Y million, plus an additional shutdown cost.. At best you can do some extrapolation. Also crucially, integrating growing amounts of renewable energy onto Germany’s grid presents infrastructure difficulties. Even the current amounts of renewable power have proved difficult for the grid to handle; congestion is routine and significant work on the transmission system is planned. And costly upgrades are needed to bring power from large northern wind farms to the southern population centres.. ..Under the EEG, renewables get priority access to the grid, and while they are online many coal plants stand idle. All of the European countries that I’ve looked at give priority to renewables. That means: “Hello this is the grid operator, coal plant X and gas plants Y, Z need to shut down for the next 4 hours”. This might cause more problems than it solves. on August 25, 2015 at 4:03 pm Mike M.
ERCOT (the Texas interconnect, i.e., “grid”) recently spent $7 billion to upgrade their transmission lines to accommodate 18 GW of wind capacity. That is close to 20% of the cost of the turbines. Of course, he upgrades are being paid for by the ratepayers, not the owners of the turbines. ERCOT (the Texas interconnect, i.e., “grid”) recently spent $7 billion to upgrade their transmission lines to accommodate 18 GW of wind capacity. I read about the upgrade, maybe we both read the same article. What’s the basis for the claim that the $7BN was for 18GW of wind capacity? In looking for real transmission costs I find mostly rehashed useless metrics so am keen to get my hands on real data..
Useless metrics = real journal papers quoting $ per kWh for building new transmission. Yes, really. And the average cost of a journey = $5.68. on August 27, 2015 at 9:27 pm Mike M.
A document that I recently downloaded from the ERCOT web site titled “ERCOT quick facts”. It is dated April, 2013 and says “$5-7 billion to support $18,000 MW of wind”. At the time, it was “under development” so I took the $7 billion I saw elsewhere as the final cost. Also, there are similar numbers in the “Hidden Cost of Wind” document that I link to elsewhere. In Part IV? on August 25, 2015 at 3:57 pm | Reply Mike M.
That is one way to look at it, but the elimination of nuclear is part and parcel of the move to renewables. Not only is it part of the same ideology, but it becomes a financial/technological necessity of having large penetration of intermittent power. Existing nuclear plants are generally not designed to provide variable output (France being the exception) or to be turned on and off rapidly. And if you build such plants they will be uneconomic since they will require increased capital cost to produce less power, compared to conventional nuclear. But the specific market solution required is to pay the producers more. Almost any problem can be solved at a price. The cost of Germany’s move to renewables is enormous. They are approaching the point where they will have times when they will have to refuse output from renewable sources because they have no place to send the power, even with conventional sources reduced to spinning reserve only. That will send the cost of renewables even higher. My prediction is that they will lose public support before they can significantly reduce the power generated from coal. Any CO2 emission reductions will have to come from burning coal more efficiently. The Swiss are buying Germany’s excess photovoltaic power during summer peaks at bargain rates and using it to pump water up to their dams. Then they generate more electricity to sell for high prices to the Germans during the winter. The Swiss get most of their baseload electricity from nuclear and use hydroelectricity to meet variable demand. No emissions and moderate cost – which is even lower thanks to the insanity going on next door. I can’t find any evidence for the claimed coal boom in Germany, nor for “Germany is burning more coal than ever”. Here are the electricity production from coal. I believe Germany is in the process of building lots of coal plants to replace nuclear plants. It takes a while to build a plant, turn it on and start burning stuff. Do you think Germany isn’t building lots of new coal plants? I’ve read various articles about this but haven’t checked into the original sources. I will check on the details in due course. Uli: The link you cite discusses how much electricity is produced from coal, not how much coal is being burned or CO2 emitted. There has been a switch in Germany from hard coal to less-efficient brown coal. This 2014 article says that coal consumption had grown 13% in the last 4 years. Due to the ongoing phase-out of nuclear power, German CO2 emissions have risen 4% since 2009 despite new renewables coming online. The German plan for the future can be seen at the link below. Consumption of brown coal, which emits the most CO2 per kWh produced, will be essentially unchanged in the first quarter of the 21st century and use of hard coal and natural gas will go down. The German government doesn’t want to tell its people that eliminating nuclear power will increase CO2 emissions. However, if nuclear power were generated at the 2003 rate (165 TWh), you could completely eliminate use of brown coal by 2023 (estimated 148 TWh). there was plans to build new coal plants to replace nuclear (and gas?) plants before 2008, but I think only few was/will build. There are now 2.5 GW coal plants under construction (started in 2007, all nearly finished), that will probably finished this year or the next years. I don’t know, but I think the other projects are stopped. This is because of an oversupply of electricity in Germany. The prices are down at 20 to 40 Euros/MWh, at the Phelix spot market. Electricity exports and net exports are increasing, but consumption is falling. on August 27, 2015 at 4:00 pm Mike M.
Less electricity from coal does not automatically mean less coal being burned. As Frank says, they are switching to brown coal. Also, coal plants are being operated at part load and being started and stopped a lot due to varying output from wind and solar. That reduces efficiency. Also, compared to 1990 they are probably using quite a bit more electricity. A more relevant time frame would be the one Frank uses: since the start of the “transition”. But that is also complicated by the recovery from the recession, weak as it has been. What seems clear is that the rush to renewables is not having the hoped for impact on CO2 emissions. The projects were stopped because the owners of coal plants were losing money. That was because renewables get priority, so the coal plants were selling less electricity and not getting a price that compensated. So now Germany has an oversupply of electricity when renewables are producing and a shortage of capacity when they aren’t. So the government is changing the rules so that the coal plants get more money so that more plants will come on line. I have not bookmarked the articles I have read on this. If I find them, I will come back and post links. Uli: The loss of 165 TWh of nuclear power (25% of demand) is a big setback to efforts to reduce of CO2 emissions. The conclusion is unavoidable: The German government has given a higher priority to eliminating nuclear power rather than CO2-emitting fossil fuel power. One can disguise this fact by saying that nuclear has been and will be mostly or totally replaced by new renewables, but those new renewables would have replaced brown coal. And the problem and expense of integration non-dispatchable renewables in a grid increase (exponentially?) with the percentage of power supplied by renewables. Once nuclear is gone, adding more renewables to eliminate brown coal (with the worst emission per TWh of all power sources) will be more difficult and expensive. on August 27, 2015 at 9:31 pm Mike M.
My conclusion is that it is driven by ideology, with CO2 as an emotional justification, not by a hard headed plan to deal with a real problem. brown coal plants are less efficient than hard coal plants, but the average efficiency is increasing over time. At least up to now this effect dominates and less coal energy is used per kWh coal electricity. 2009 as used in some of the links, is a bad starting point because of this was an exceptional year due to the recession. I due not expect brown coal consumption to decrease in the near future because it is much cheaper than hard coal or natural gas. If Germany weren’t also opposed to hydraulic fracturing, gas might be a lot cheaper. I guess you’d rather buy it from Putin.